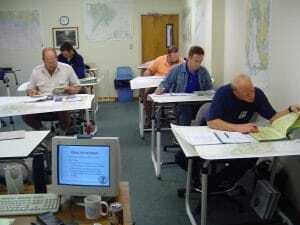 Chesapeake Marine Training Institute offers USCG Deck License Exam Preparation for mariners at various levels of their careers. Since 1992, CMTI has established an outstanding record of assisting mariners by successfully preparing them for their license examinations. All of our instructors are professional mariners skilled in sharing their knowledge and experience in order to prepare you for testing. The 5 day License Preparation Unit 1 includes an in-depth review of material required in each testing module listed. During this type of instruction, you will receive training on each examination applicable to your testing requirements generally: Rules of the Road, Navigation Problems: Chart Plot, and Navigation General. Some topics include but are not limited to: Rules of the Road, Publications, Charts, Plotting techniques, Tides and Currents, Aids to Navigation, Hurricanes, Echo Principle, True Wind, Weather. Training also includes a review of the applicable publications and how to use reference materials for these exams located in the testing room. The pace of the course is based on students prior experience with the material covered in these modules. We recommend our 5 day License Preparation Unit 2 or 3 for those taking examinations for Navigation Problems, Deck General / Deck Safety / Stability modules. During the 5-day license preparation, focus will be geared towards the information required on the Navigation Problems for Near Coastal / Oceans examinations. Some of the topics include Chronometer Error, ETA, Fuel Consumption, Slip/Pitch, Deviation Table Construction, Sunrise/Sunset, Amplitude, Azimuth, Sailings, Distance Abeam, and more. This license preparation should be taken after the Unit 1 or when you want to focus on the Navigation Problems examination topics. Preparation for Oceans topics can be added to the end of this unit for an additional fee. During the 5-day License Preparation Unit 3, focus will be geared toward the information required on the Deck General / Safety / Environmental Protection / Stability modules. Some of the topics include Marlinespike Seamanship, Block and Tackle, Nautical Terms and Construction, Anchoring, Trim and Stability, Vessel Handling, Maritime Law (CFR), Fire and Emergencies, Dew Point/Humidity, Cargo Loading, Broken Stowage, Advance and Transfer tables, Pub 102, Pub 117, Chemical Data Guide and more. This license preparation should be taken after the Basic License Preparation or when you are prepared for most exams and want to focus on the Deck General / Safety/ Stability examinations. Unit 4, Exam Preparation Only is a 3 day program for mariners who are preparing to test and want to ensure they have the knowledge level necessary to successfully pass all examinations. 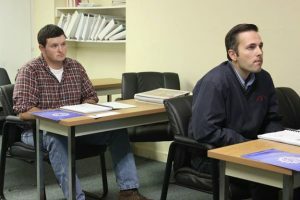 During the 3 days, mariners will be tested on all topics required as shown on their approval to test letter. Once the mariner completes the practice examinations, considering time is available, our instructors will provide tutoring / guidance on topics that are necessary to review at home prior to testing. This unit should be planned at a time close to the testing date to ensure material is retained and / or give the mariner time to review material as directed by the instructor. This is not an instructional preparation course; please refer to our other license preparation options for instructional needs. * Additional days of tutoring can be scheduled as needed.